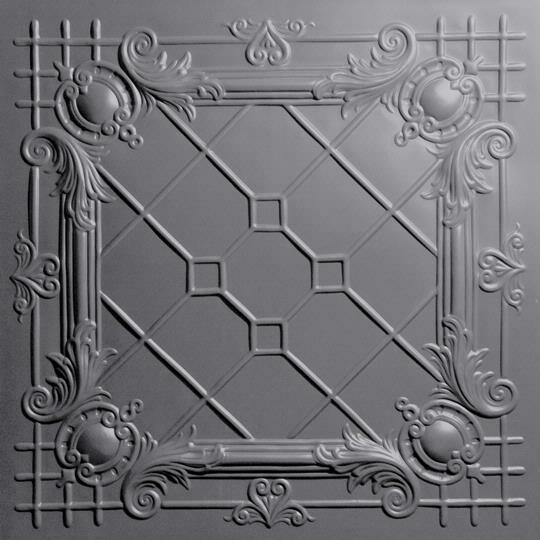 Bentley Ceiling Tiles capture the rich, intricate flavor of the Baroque period. Made from our Signature Series 0.030 in. 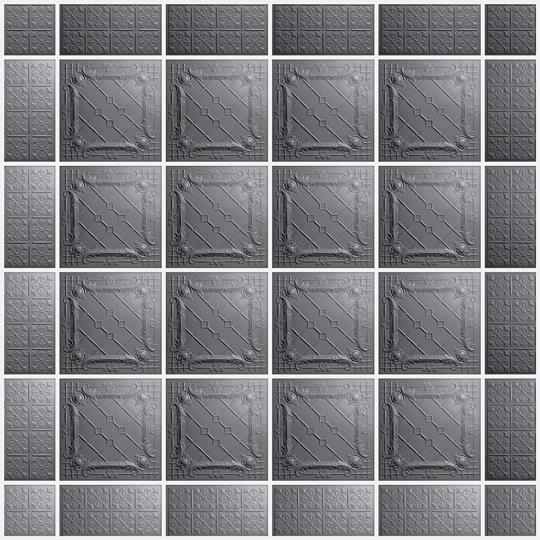 thick vinyl plastic, they are thermoformed from molds based on original, hand-crafted tin ceiling tile designs. In addition to providing the ultimate in sustainability, our new random gray material has all of the features of our other colors and at a reduced cost! It also gives you a unique design opportunity - because this material is made from 100% post-manufacturing scrap, the color (while always some shade of gray) is truly random as it is determined by the material that is recycled. The color tends to be a light "charcoal", but it can shift from dark to light, from batch to batch, and even within a single order, ensuring your ceiling will be unlike any other. Can your glue up Benley faux ceiling tiles be trimmed at the ceiling edges intead of using different style trim (e.g. fleur de lis)? Can this be done with or without crown molding? Will it look professional when complete, or must I use a border? The design of the Bentley projects downward from a ceiling by 1/2&quot;. It is difficult to create a clean cut that will sit flush against the wall when cutting the Bentley for the border areas. As such, we recommend using a Fleur-de-lis or Continental as a border. The low relief pattern of those two tiles allows for a much cleaner cut. Crown molding is a nice touch to finish off a room but is not necessary. A thin bead of caulk is an easier and less expensive way to finish off the perimeter cuts for a professional looking installation.